I LOVE game day! Most people in Columbia focus their day around watching the USC game and/or tailgate. Logan and I however, love game day for a different reason: Less crowds out-and-about, especially restaurants. The past game day, we went to Mellow Mushroom. There was no line on a Saturday night to get a table. B-E-A-utiful. We had the Kosmic Karma and boy was it deeeelicious. 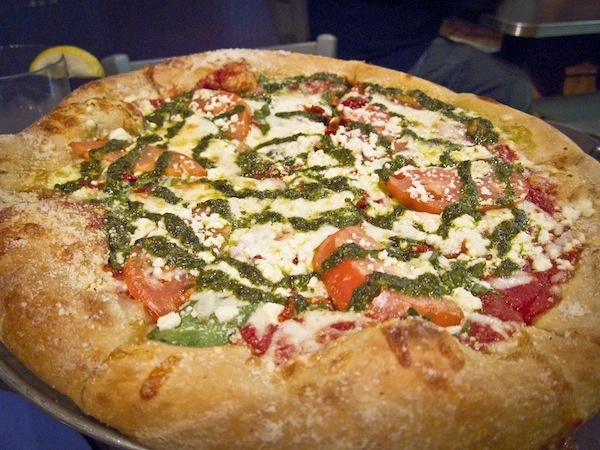 You just can’t beat the flavor combination of tomato sauce, pesto, basil, tomatoes, feta, and mozzarella cheese. We don’t have any Mellow Mushrooms up north, which is a shame. I hear they’re one of the first companies to start making gluten-free crust. I would LOVE to try that. Mellow Mushroom is my faaavorite! Well, specifically for pizza. LOVE the mega veggie! We tasted MM pizza for the first time in Franklin, TN, on a recent trip to visit a new grandson. Wow, it was fantastic. Among the best pizza I have ever had and in my 56 years of living, I’ve tasted a lot of pizza. I do hope they get up to WA state soon and in my neighborhood. I have a son who goes to college in Tempe, AZ, and he said there is one there now, so they are moving out west, YAY!